Owning a home never seemed so simple. Get a mortgage, take advantage of the low interest and pay less than rent. Buying a home has its perks. You no longer have to pay rent that goes to no one but your landlord. Buy a house instead of a condo and you don’t even have to pay those pesky maintenance fees that eat away at you like bedbugs. For most people the only expense they see with owning a home is the mortgage payment. Make that payment and you can sleep safe and sound. With the popular belief of all those points listed above, it’s no wonder that 70% of the Canadian population have embraced home ownership. If you are looking at a room of 10 people and you’re still renting, then you are the minority. The notion that home ownership can be so advantageous can be misconstrued. For every good argument there is a bad one because, unfortunately, most people don’t understand the true cost of home ownership. Owning a home is definitely not a right. It’s a luxury. For most people it’s their dream. Almost dating back to the early settlers of North America, owning a piece of land that you can call your own was one of the main reasons people fled from continental Europe. Owning land was great because you could generate crops, feed your family and perhaps even raise some livestock. In the modern age, the necessity to have all that land is moot. Does anyone grow their own food and raise chickens to lay eggs? I don’t think so. Owning a home brings about many costs that are hidden. These are costs that either the realtor doesn’t tell you when you go shopping for a home, nor is it something that your parents would tell you either because they are costs that are not paid on a frequent basis. All this shroud and mystery is what makes people think that owning is home is easy and simple. One of the major costs of home ownership in Canada is property tax. Renters don’t have to pay the tax, only home owners. Despite the fact you own your own home, the government taxes you for having the privilege of owning the land. It’s somewhat counter intuitive. You own the land and the home, why must you continue to pay? Welcome to the world of taxes. Property taxes can run anywhere from a few hundred to a few thousand a month depending on the size and location of the home. It’s a significant amount of money and it’s something that’s generally not paid frequently. This requires home owners to be diligent of their expenditures on a monthly basis to ensure that the large property tax bill that comes infrequently can be paid in full. Another big cost of home ownership is maintenance fees. Whether you live in a condo or strata be prepared to pay anywhere between $0.75-$1.00 per square foot. If you’re in a new building, don’t get too comfortable with the low fees because once the warranty of the building is expired and upkeep is required on an ageing building, maintenance fees will begin to rise. Those that buy freehold homes will probably bask in the fact that they have made the right choice. The fact is, the maintenance fees that condo owners pay, home owners need to do the same. Maybe even more. Ever wonder how much it costs to replace the roof? Replace the windows? Fix the furnace? Repair the air conditioner? If you are not prepared to save the $3000-4000 dollars annually for regular maintenance of your home, then you will be setting yourself up for a world of hurt once things start to deteriorate. Unlike condo owners where the collective owners pay for the maintenance of the building, home owners need to pay that themselves. Remember those sparkling stainless steel appliances and ultra modern washer and driers? They too will fail, without a doubt, over a ten year period. Have you been preparing for the day when you might have to spend the $5000 to replace them all? It might seem like nothing, but that’s another $50 a month that should be allocated to your household expenses. Nothing is worse than having a laundry machine break down and having to borrow $1000 on your credit card to replace it just to get clean clothes. One of the key things towards budgeting is making sure your expenses are covered. When you own a home, expenses that are 10-15 years away have to be accounted for because you don’t want to be spending money you thought you had for a vacation in Cuba, when in reality you really needed that money to replace the furnace that keeps you warm during cold winter days. When you’re renting the only belongings that you have to insure are your own. When you own your own home, it’s important that you protect your asset from any unfortunate mishaps. 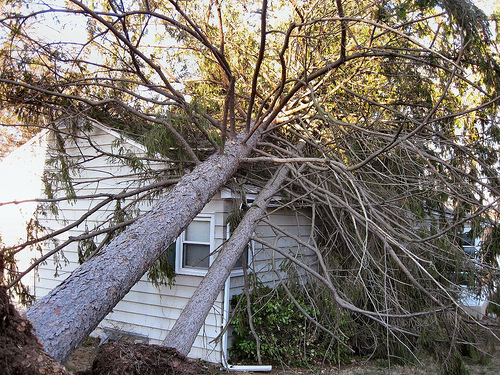 Given what has happened over the course of this winter, it’s not unfathomable to think that some kind of natural disaster might have an impact on your property. Burst pipes, wind damage, tree damage, or even flood damage are things that could cost tens if not hundreds of thousands to fix. This is why it’s important to get insurance to cover some of these expenses. Possession insurance isn’t enough for home owners because it only covers the expenses of things internal to the home. Getting additional coverage for the structural integrity of your home will cost more in insurance premiums, but it will provide you the peace of mind necessary to sleep well at night. One other notion to think about carefully for insurance is whether you have dependents or not. If you have bought the home with a spouse or partner, there should really be consideration for any event whereby one of you are unable to make payments on the mortgage for some unforeseen circumstance. Getting additional life insurance coverage for mortgage payments might be something that should be considered. Considering that a mortgage is such a large sum of money to repay and during times like today when one household income is not enough to make the payment, insurance might be the only way to prevent losing the home if something should happen to one person. We never want to have to think about these unfortunate incidents, but mortgage coverage through insurance is something that home owners should be considering as an additional expense especially if they have dependents. It’s important to understand all the little expenses that go into home ownership. Just like becoming a parent, becoming a home owner brings about a lot of responsibilities that one would not have if they rented. Be prepared to budget your expenses accordingly to include a lot of the future expenses that will come along. Don’t fall into the trap of delaying your expenses to the last minute and certainly avoid having to use credit to fund the maintenance of your home. It’s already a painful enough having to pay so much interest just to buy a home, but having to pay interest on regular home expenses is just back breaking. Stop giving away your money to the lenders by borrowing for your expenses. Remember you want to be benefiting from collecting interest not paying it. If you are not ready to take on the responsibilities and expenses associated with home owning, perhaps it’s time to reconsider renting instead.